Violinist Carly Castro warms up during a recent South Shore Symphony Orchestra rehearsal at the SouthShore United Church of Christ, the venue for all five of this year’s concerts in Sun City Center. 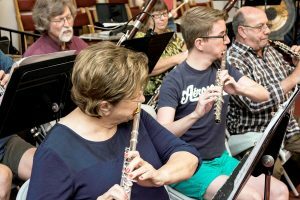 Members of the South Shore Symphony Orchestra have been rehearsing all month for its 2016-2017 season, which begins in Sun City Center Oct. 23. 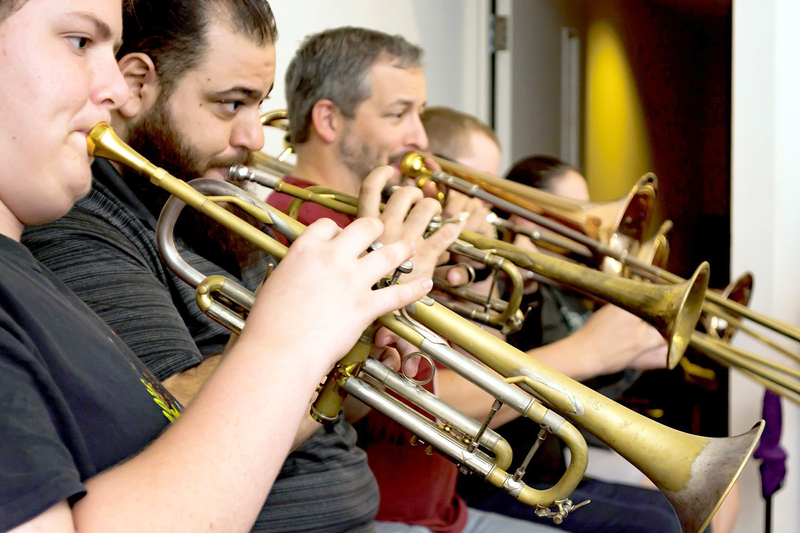 Founded in May 2010 by lifelong musician and booking agent Dominick Galati, the nonprofit, professional orchestra now includes 40 musicians from throughout the greater Tampa Bay area who enjoy playing for audiences that appreciate their energetic and personalized concerts. Currently conducted by Artistic Director June C. Hammond, a tenured professor of music at St. Leo University, the orchestra provides a diverse array of music aimed at pleasing the musical palates of a diverse audience. Original member George Linakis, who plays the clarinet, said he likes playing in the South Shore Symphony Orchestra. 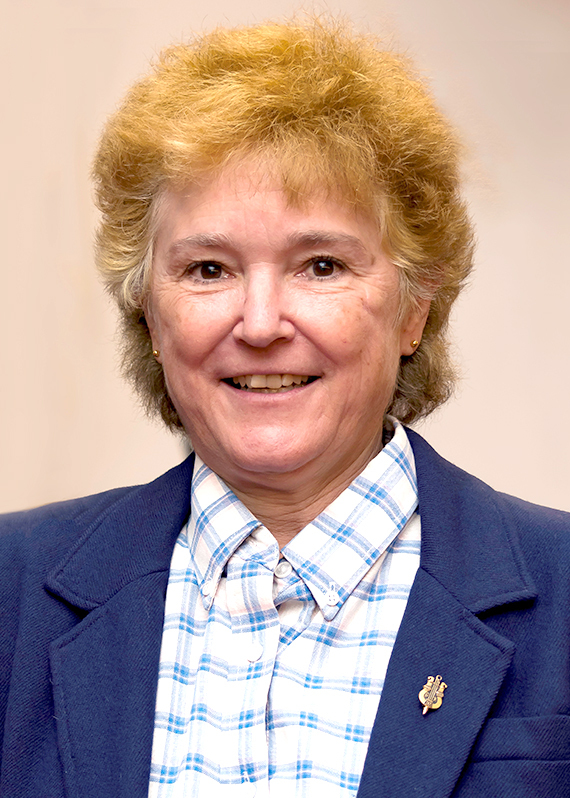 Artistic Director June C. Hammond, a tenured professor of music at St. Leo University, became the principal conductor of the South Shore Symphony Orchestra in 2015. According to Hammond, that reception has made the orchestra responsive to the public’s tastes. The mix could include Tchaikovsky, Copeland, Mozart and Bach, as well as Bernstein, Rogers & Hammerstein, Gershwin, Copeland and more. Brass section members of the South Shore Symphony Orchestra practice a number for “Destinations,” the first concert of their 2016-2017 season. Hammond, 57, a resident of Wesley Chapel, began playing piano at age 6, switched to the trumpet in the fifth grade, and then to the bassoon in high school. 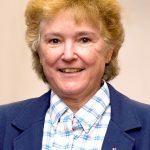 She holds bachelor’s degrees in music education and mathematics from Furman University in Greenville, S.C. (1981); master’s degrees in bassoon and mathematics from the University of Georgia in Athens (1984); and a doctorate in bassoon from Florida State University in Tallahassee (1987). In the past, Hammond performed as a bassoonist with Luciano Pavorotti, Ray Charles, the Moody Blues and with Anton Coppola and Opera Tampa. 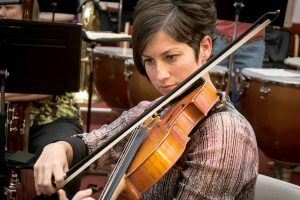 She came to the orchestra as principal bassoonist in October 2010 and became its lead conductor last year. 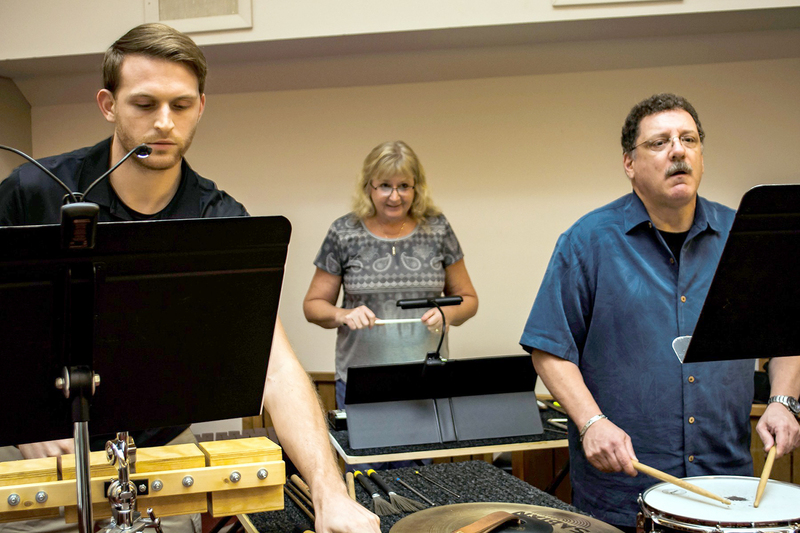 Family members Mark, Carol and John Boccoli play together in the percussion section of the South Shore Symphony Orchestra. 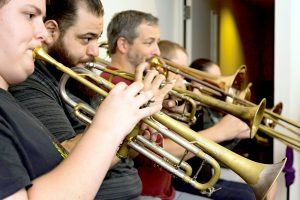 “Playing in South Shore gave me an opportunity to play in a regular, high-quality orchestra with good conductors where there weren’t any other organizations like it,” Hammond said. She currently plays for the Lakeland Imperial Symphony Orchestra, as well. Last year Hammond earned an advanced graduate certificate in orchestral conducting. The symphony’s musicians are paid from ticket sales, she said. John Mark reviews some sheet music before a recent South Shore Symphony Orchestra rehearsal. 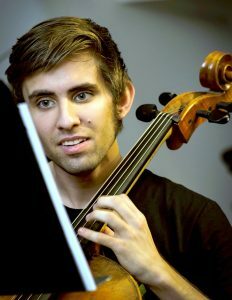 All 90-minute concerts, which include intermission, will be performed on Sundays at 2 p.m. at the SouthShore United Church of Christ, 1501 La Jolla Ave., Sun City Center. Tickets are $15 per person, with $5 discounts available to season-ticket holders and groups of 15 or more people. For ticket information, stop by the church, or call 813-634-1304. For additional information on the symphony, visit southshoresymphonyorchestra.org, or facebook.com/SSSOTampaBay. Orchestra sponsors include GK Hebert Photography, SouthShore United Church of Christ, Michele Moreland CPA, Innovative Solar and the Interfaith Council of Sun City Center, which recently gave a significant grant to augment the percussion section with a new xylophone, 26-inch Chinese gong and an electric keyboard that has 450 sound effects. For sponsorship or donation information, email SSSOTampaBay@mail.com. Members of the South Shore Symphony Orchestra rehearse at SouthShore United Church of Christ for their upcoming season, which begins Oct. 23.